Daylilies (Hemerocallis spp.) are perennial flowers adapted to various soil and light conditions. Daylilies are not true lilies. This bulb produces 1- to 4-foot-tall clumps of green, grass-like leaves. Tall, upright stems produce large, trumpet-shaped blossoms in nearly any color. These blooms last for one day each. Daylilies produce an abundance of flower buds that last throughout the summer. This perennial survives summer heat and tolerates cold winters. Daylilies are used as perennial borders, mass plantings, ground covers and container plants. Plant daylilies whenever the soil is workable. Till the soil as deep as possible and work in well-rotted manure or compost to enrich the soil with organic materials. Dig a large hole. Do not bend the roots while placing the daylily in the ground. Ensure that the crown is 1 inch below the surface. Place the remaining daylilies 2 feet apart and water thoroughly. Water daylilies once a week if there is no rainfall that week. Daylilies need at least 1 inch of water a week while they are actively growing. If planted in sandy soil, then water twice a week to ensure adequate moisture. Cut away dying blossoms with a sharp knife before seed pods form. Deadheading the flowers prolongs the blooming period of daylilies. By preventing the production of seeds, the daylilies direct their energy into creating more flowers. Spread 4 to 6 inches of straw mulch over the daylilies in the late fall in areas with heavy winters. Newly planted daylilies are subject to freezing temperature damage so they need mulch as well. Remove any dead foliage and winter mulch in the spring before the new growth starts. Spread 1 to 2 inches of well-rotted manure or compost around the daylilies. Scratch the organic material into the soil to the depth of 2 to 3 inches with a rake. Feed with 10-10-10 slow-release fertilizer. Scratch it into the top of the soil in the early spring after removing the winter mulch. Spread 1 to 2 inches of wood chips, grass clippings or shredded leaves for summer mulch. This mulch reduces weed growth, cools the soil and conserves water. Divide daylilies every three to four years when they begin to crowd together. The best time to divide is during the early spring or right after the daylilies have finished flowering. Pull the plants apart with two to three fans of leaves attached to the roots. Cut the leaves back to 5 to 6 inches above the soil line and replant. Daylilies grow best in sites with a minimum of six hours of sunlight a day. This perennial will tolerate light shade in the afternoon. 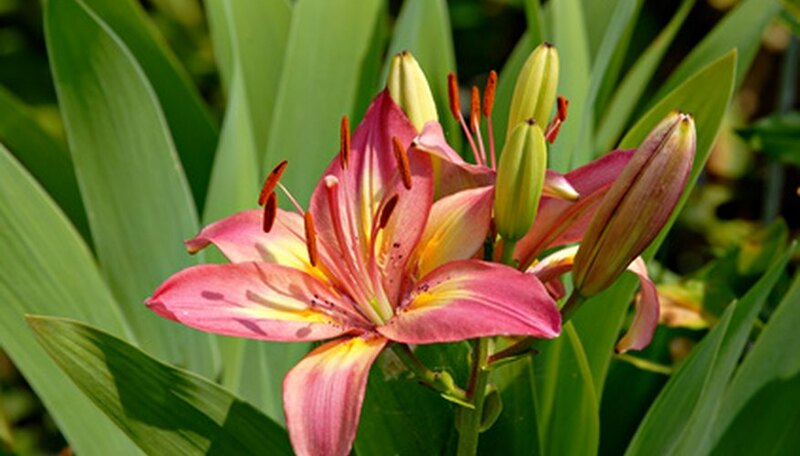 Do not plant daylilies under trees and large bushes. This will cause the daylilies stress as they compete for moisture and soil nutrients with the larger plants.